Monday to Friday 9:30 am to 7:00 pm. The parts include: body panels, bumpers, door mirrors, grills, front and rear lights , radiators, trim and mechanical parts. We also have sunroofs, glass window winders, workshop manuals, hubcaps, wheels and tyres, decals, plus much more. Please phone: 02392821059 for details. Alfa Romeo Guilia Super Nova 1.3, November 1976, for sale. Competition Rally Car Vauxhall Astra Mark 2 Road legal for sale. Phone 02392 821059 for details. Car Repairs, MOT and Servicing. 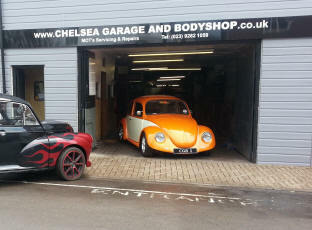 The garage is located at 2 Chelsea Road, Southsea, Portsmouth,PO5 1NJ. Darren and his team are extremely competent in body work and mechanics. Darren, the owner, can be contacted on 02392 821059. The garage was established in 1978. 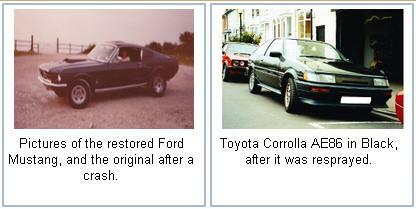 The types of models that can be rebuilt and repaired date back to the time before there were ECUs. We accept most major credit and debit cards. We remove and scrap unwanted vehicles and buy classic cars.